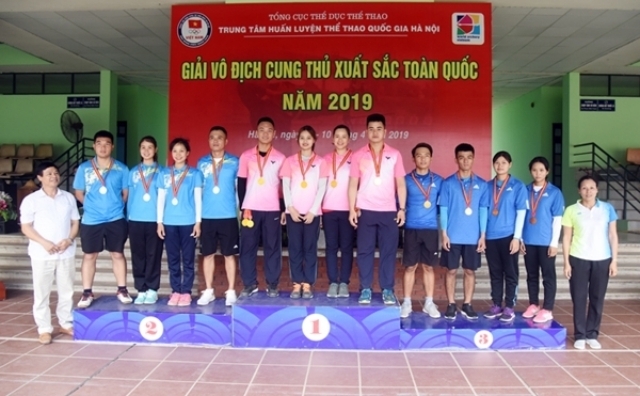 HÀ NỘI — Hà Nội triumphed at the National Outstanding Archers Championship which concluded at the National Sports Training Centre in Hà Nội on Wednesday. The team took 15 gold, 16 silver and 11 bronze medals. Hải Dương were runners-up with 10 golds, six silvers and four bronzes, while Vĩnh Long finished third with five golds, six silvers and seven bronzes. Two national records were set at the event this year. Lê Phạm Ngọc Anh of Quảng Ninh made a new record with 695 points in the women's individual compound, beating the old record of 693 points. The other new record belonged to Đỗ Thị Thuý Hằng of Hà Nội in the qualifying round of women's compound event with 148 points, beating the old record set by Huỳnh Thị Hồng Gấm of Vĩnh Long in 2017 with 147 points. Following this event, the national archery team will leave for South Korea for training from April 15 to May 12. Then they will compete in the World Archery Championship in the Netherlands on June 6-17.